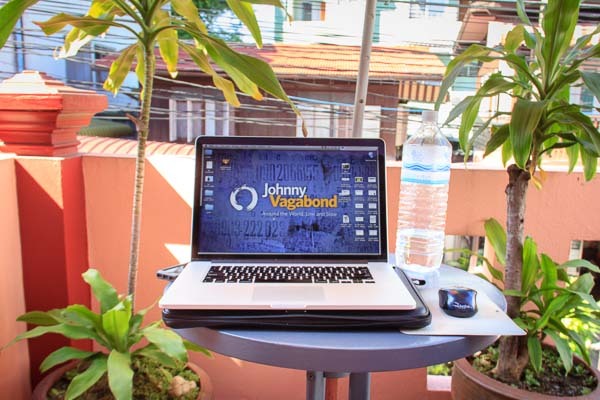 Welcome to Johnny Vagabond World Headquarters for the next couple of months. It’s the beginning of high season here so my options were less than I’d hoped, but I managed to find a clean, comfortable place the first day I went looking at a locally-owned place, D.N. House. 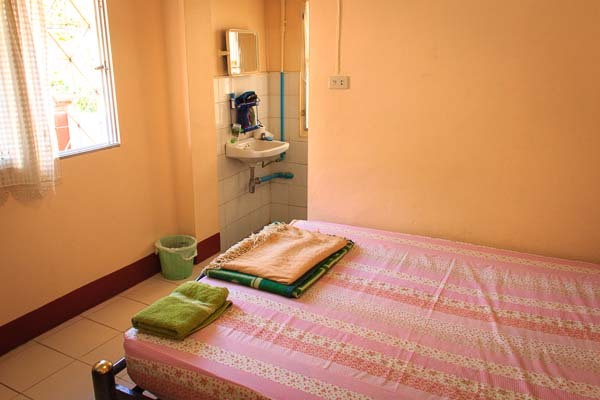 For this price, I get a large room with strong AC, a mid-sized refrigerator, solid wifi, cable tv and a hot shower. There’s a nice terrace outside my window that overlooks the soi (I’m only one block away from the main tourist area of Taipei Gate but it’s nice and quiet here). It makes for a nice office in the morning and afternoon when the sun isn’t glaring down on me. 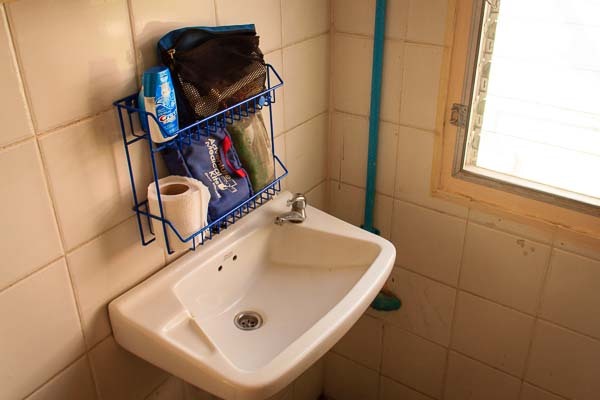 I could have found nicer digs if I’d been willing to live a bit further out –I just spoke to someone who gave up a two-bedroom house for which he was only paying $175– but I wanted to start off in the walkable part of town and work my way up to renting a scooter. This is $225 per month, all utilities included and with no deposit — pretty easy. Best of all? My favorite Thai place is less than a block away and makes great Khao Soi soup and has that rare Thai iced coffee that is made with real drip coffee and isn’t overpoweringly sweet. I’m in love. Nice digs! My travel companion/husband and I were just discussing the ups and downs of renting a month at a time. We just arrived to an apartment in Istanbul where we’ll be for a month, and while it will do, it’s not at all what we expected. We booked ahead of time and I suppose it’s better to have a look at the space first before committing for a whole month. I always worry that there will be nothing available. I am stuck in this mindset that I have to have my home secured well before I arrive! Looks here like you found a great spot, even in high season. We’re excited to visit Chiang Mai in January! I enjoy your blog very much. Looks like we may finally meet in a few months Wes. 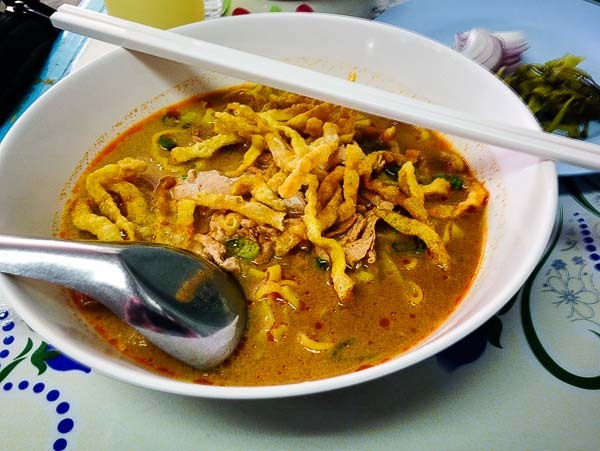 Plan to be back in mid Dec.
Khao Soi! Gosh, I am missing it already! Pamela recently posted..I am flying to Chiang Mai for free! Nice Wes. Looking forward to reading what comes out of WHQ over the coming months. OK, I must admit, my first thought was ..OH MY GOD he has to pay that much for that room! Of course, I was thinking you were paying $225 for a night and as I continued reading, I realized it was for the month! Whew! As always Wes, I enjoy every minute I spend reading about your life adventures. Stay healthy and safe. Nice! I usually do something very similar. I stay at SK or Libra (about a block away) for a week and then move outside the ring road to Nimmanhemin. I’m always curious how people find new places like this. How did you find DN? It looks nice and a fridge and a/c/ in a room for that rate is a great deal. Nice work! See you this weekend AND next February. I have yet to stay long-term up there. I’m so excited! I’m at Smith Residence, just south of Chiang Mai gate. So, are we finally going to get to meet? Will be here thru Dec. 15! Great price, even $50 more it’s worth the extra bucks to be close to the places you like. Fabulous! I’m in the midst of a Chiang Mai vs Bangkok debate in terms of renting an apartment. Missing the Thailand sunshine, street food, and culture. Enjoy CM! I lived in Chiang Mai for a few months and can’t wait to get back. What a great city! Be sure to check out the unlimited beer and wine “buffets!” Enjoy! I found out about your site through the post Michael Hudson wrote about top travel blogs, and it turns out, you’re in Chiang Mai at the moment as well. Fantastic, I look forward to reading your posts. The old city is great– I kept to walking for the first three months I was living here and staying at a guest house relatively close to Taipei gate– my recommendation? Don’t wait too long before you rent the motorbike. It’s the greatest investment you can make for Chiang Mai. Especially when the best thing about living here is being able to jump on the bike in the afternoon and go off exploring in the mountains. It becomes an entirely different city after that. Enjoy!! Renting an apartment is a great way to feel like a local. Sweet deal on the rent! Since SEA is so cheap, it probably makes more sense to dine out than cook at home. I have had a kitchen in my Chaing Mai place. So far I haven’t managed to even put beer in the refrigerator. There are just too many easy food options here. Hey me and a friend (both 21) are going to be in Chiang Mai for a week in about 10 days time. I real your blog a lot as it has great advice. I think it would be pretty cool to meet up with you and buy you a beer if you’re not too busy. If you can I totally understand, if you can how should I contact you? I love the look of this place – it’s basic but you have everything you need. It really hammers home the point that ‘things’ don’t mean an awful lot. It’s all about people, places and experiences. I’ve just handed in my resignation at work to pursue my business ventures and will be heading out to Thailand at some point in 2014. If you fancy meeting up do let me know! Just found your site probably because your like literally here. Been checking out your website well done. If you need to know anything about Chiang Mai especially the Nightlife let me know. Welcome to town. $225 that is so cheap and your place looks very nice. My boyfriend and I will spend about 5 days in CM in January. I haven’t booked any accomodations yet, I was thinking about just finding something once I arrive. I hope I can find something. Nice and simple. They have some vegetation on the patio which is always nice. It looks like a nice place. Enjoy Thailand! I love the simplicity of it. you can’t really scoff at $225/month either! Lina @ Divergent Travelers recently posted..You WILL See Animals in the Amazon! Not bad for the staying almost in the center :) Is just sometimes a lucky day to get it. We pay a bit less not far from the Chiang Mai Gate. Wes, how do I book a room at DN House? I can’t find them online. I would like to have something booked before I arrive in January. Is DN House usually fully booked? I’ll stop at the office and get a biz card, then email you the #. I don’t think they have an online presence — very old school joint. Great location though. Duuuuude. This makes me miss Thailand. So great, so cheap. So… food!! My fiance and I just rented out first house aboard in San Pedro, Guatemala. It is great and also really cheap. Renting is the way to go if you want to extend your trip. It obviously ties you down a bit more but it extends your travels abroad! Your website is really fascinating and really helpful!! My partner and I are looking to travel SE Asia in December for as long as possible, and this looks like a perfect place to stay when we reach Chang Mai!! Do you mind sharing the name of this hotel? It’s called DN House and it’s a fair value, depending on how long you plan to stay. Nothing fancy but clean with a hot shower. If you want, I can email you their phone #. They don’t have an online presence. When you enter via Thae Pei Gate (sp? ), it’s the first soi on your right. DN Guesthouse. Nothing fancy but cheap and with nice people running it. Thanks for sharing! I am living in Korea right now teaching English, and I am going to move to either Thailand or Vietnam in September to pursue my digital nomad dreams. Do you know if there are any places in Vietnam that are this cheap to live/month? You’re pretty good with haggling. Your visitors will learn many things from you. Now that is cheap, tell me you didnt hook up with those crazy DC’rs yet!? This actually looks very nice for the price and for Chiang Mai. Chiang Mai has been going up in price in the last couple of years, especially during high season, so it’s become more difficult to find something comfortable under $300 a month. 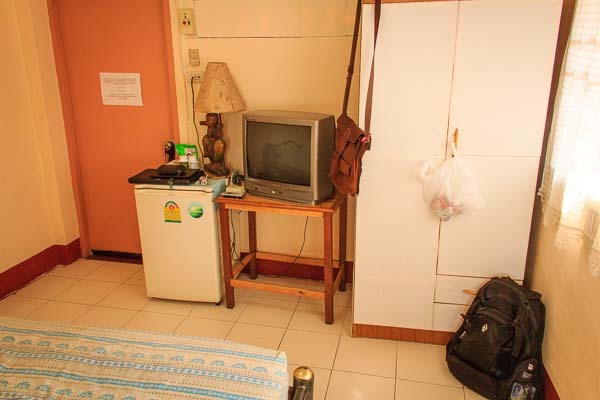 I’m in Bangkok, for instance, and I only pay $390 a month for a huge one-bedroom (with living room, small kitchen, western style bathroom etc) in a serviced apartment with maid and cable TV. And I’m only a couple of blocks from some of the major malls, underground etc. My one is only 7000 baht a month, new, built-in furniture, fully furnished, and equiped with microwave, rice cooker, and fridge.